"A strong tasting cheese bread." Select White Bread or Basic cycle. Start. This was the only time my bread "caved", I think I may have used too much pepperjack. 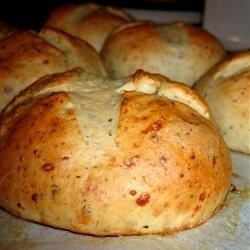 My husband loves this bread but at first said it was too dry, so I added 1/4 cup of oil to the recipe and now he says its great! This recipe was extremely easy to make. The taste and texture were excellent. I also used this recipe to make toasted garlic bread. WOW! Delicious! Wonderful texture and great taste!! Spicey enough for my husband, but not too spicey for me (our pepperjack was a very spicey jack cheese). This is a great bread! Everyone I have ever served it to asks for the recipe. Even my two preschoolers love it. Thanks for sharing this one.